The research demands of my second novel have required me to spend much of my time recently in fourteenth century birthing chambers. I have been buried in tracts on the rituals and beliefs surrounding pregnancy and the many hazards of delivery. These have proved a fascinating revelation, if somewhat gasp-inducing given that I spent my own twentieth century pregnancies resolutely refusing to read a thing or accept the inevitability of how it was all going to end. For many women of the upper classes, pregnancy rituals began outside the birthing chamber. Very public pilgrimages to pray for conception or a safe delivery were common, particularly to religious sites associated with the Virgin Mary such as Our Lady of Caversham and the shrine built in 1061 at Walsingham by Richeldis de Faverches which was reputed to house a vial of the Virgin's milk. Once her time drew close, however, childbirth became a secluded affair from which men, unless the circumstances were exceptional or the child was royal, were very much excluded. 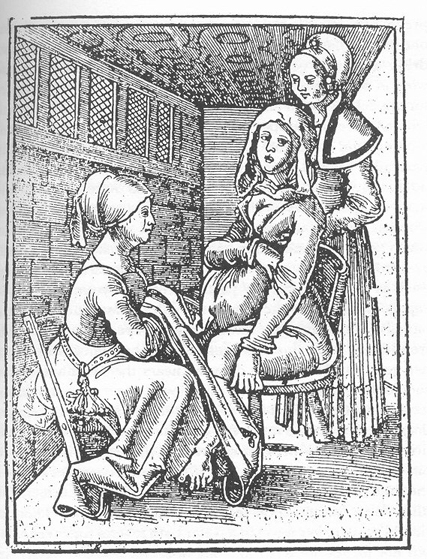 Medical treatises on childbirth were available in the fourteenth century although it is difficult to gauge their practical importance. The most common, The Sickness of Women, was a translation of a far earlier work by Trotula de Salerno. Trotula was a wealthy woman, born around 1090, who became a professor at Salerno's Schola Medica Salernitana. She held forward-thinking views on the value of pain-relief in childbirth, encouraging the use of opiates and herbs. It is a stretch to imagine many midwives knowing this work: most were apprenticed young, were illiterate and learned their skills on the job. 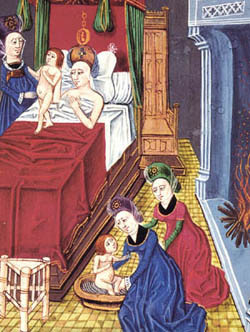 The actual practice of midwifery was unlicensed, and therefore overlooked, until the 1500s when the Church got rather jumpy about these unregulated women with their mix of charms and religion and their ability to perform baptism, one of their sadder duties when the child was not expected to survive. However, the importance placed on tackling pain rather than accepting endurance as a woman's lot (the religious, male view) can be seen throughout their birthing practices. So what was life like for the expectant upper-class mother confined to her birthing chamber? With the regard often shown for the sensory aspect of medical procedures in this period, her experience was conducted in a place kept dark, quiet, scented with purifying herbs and warm. Tapestries lining the walls depicted only soothing images. The birthing chamber was, in may ways, an external recreation of the womb, its aim to ensure the safest transition for the child and therefore, hopefully, life for both baby and mother. Symbolic barriers to the womb opening were removed, especially if the labour was proving complex: cupboard doors were opened, knots untied, hairpins removed. As with battlefield surgeries, chanting was an important part of the calming process. 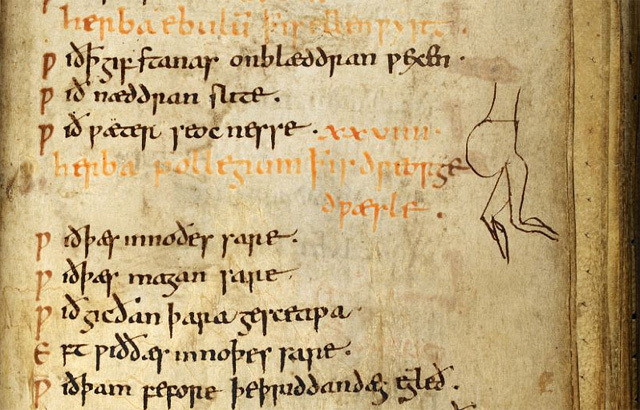 Prayers would be offered to Saint Margaret who managed to get herself spat out of a dragon's mouth. 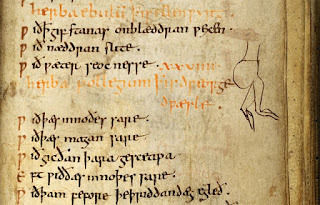 Other charms have been found which mix Latin with English but all require their words to be repeated three times: a hangover from pre-Christian days perhaps. Just as you, stone, by the order of God, shone on the first angel, so you child, come forth a shining person, who dwells with God. Birth girdles were commonly used throughout the social levels. These could be sewn together from strips of parchment bearing charms and prayers and handed down through families or, for royalty, could have real iconic status such as the girdle of the Virgin held at St Peter's Westminster which was used by Henry III's wife Eleanor or the girdle of St Ailred kept at Rievaulx Abbey. In addition, the mother might have amulets or charms placed on her stomach to speed contractions, coriander put on her thighs to attract the baby and poultices of eagle's dung or rose water (possibly to counteract the eagle's dung) rubbed in to alleviate the pain. For a particularly difficult delivery, the midwife could take the thread she had used to measure the women's progress with, turn it into a candle wick and then burn it while offering prayers to their preferred saint. Once the baby was safely delivered, the rituals continued. The cord had to be burned to get rid of the sins thought to be transmitted with conception. Herbs would be used to make the baby sneeze to expel any last remaining sin. Vinegar would be rubbed on the baby's tongue to ensure speech would follow. These were all purposeful, happy rituals: birth had been survived by both mother and child and, although dangers remained, the midwives' main task had been completed successfully. It is impossible to determine whether or not any of the methods employed to relieve pain actually worked - I am definitely on the fence when it comes rubbing gemstones to ward off speeding-up contractions and can just imagine the reactions of most modern women if it was suggested. That, however, is not the point. 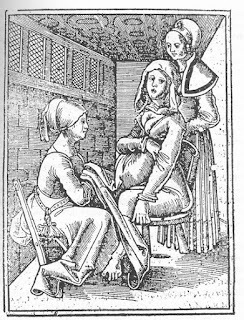 With child and maternal death rates so high, a medieval midwife's main aim was to get labour completed as quickly as possible thus minimising the chance of complications. The best way to ensure this? A calm, trusting mother who believed herself to be in safe hands. Some things, at least, do not change. Enjoyed this Catherine. Will share. Fascinating! Placebo effect helped a bit, I guess. If the 17th century is anything to go by, the major problem was the absence of forceps or safe c/ section, hooks were used to get a dead baby out, and that must have led to infection. Eagles' dung sounds a bit dodgy, too! On the other hand, all the quietness must have helped, as you say; something harder to provide in modern hospitals, though they do their best: also the continuity of care. Brilliant article, I was sat eager for more. If you don't mind, do you have any recommended reading on childbirth practices? As a young teen on a school trip to London and the science museum in the very early 80's I managed to escape the structure of the Nuns who were taking us through the acceptable bits of science (no, do not ask) and I found my way up a small set of stairs to the medical historical section, back when things had small white cards saying what it was and you used your imagination to see how it worked, and I found early forceps and birthing chairs with straps to hold to mother 'safe' in it. I spent a eye opening hour wandering instruments and tools of torture from midwifery of the past and what struck me most was how crude it all was esp the care of the mother and child. A decade and half later my own experiences were very different but the sadness and fear of the items from earlier times has never left me (even of the museum no longer has that display set up). Thanks, Catherine, this is fascinating. Fascinating article, many thanks. And it wasn't until the advent of the National Health Service in Britain in 1948 that the maternal death rate really fell. Our grandmothers had a one in four chance of dying in or shortly after childbirth - for EVERY birth. No wonder many of our great aunts decided not to marry at all. David Starkey's book about the childhood of Elizabeth I has a fine detailed description of 16th C 'confinements'. Thank you for all the comments and for Janie's response on the Starkey book. I have to confess I am yet to find a definitive book, most of my research has been gleaned from reading multiple sources that often amount to no more than a paragraph in a published work and sometimes a line! However, Nicholas Orme's book on The Medieval Child is very good in a wider context as is Beekman's The Mechanical Baby.